We began a STEM project in the summer term last year and our aim was getting children (mainly in developing countries) to wash their hands more. The students wanted to help reduce deaths caused by preventable infections such as diarrhoea and pneumonia. This project was initially inspired by the Unilever Brighter Futures Competition, which we won in July 2017. When we became aware of the theme of the Youth Grand Challenges competition, it gave us the basis to take the project in a new direction. The Youth Grand Challenges is a STEM competition organised by the British Science Association (BSA) that aims to inspire young people, aged 11 to 19, to see how science and technology can be deployed to tackle global health issues. The competition calls on students to design innovative solutions in their own time, outside of lessons, which have the potential to change the world. To be eligible for the Youth Grand Challenges, projects must have been submitted for a CREST Award beforehand. CREST is a STEM enrichment programme also run by the BSA (see later). The Youth Grand Challenges is supported by the Bill and Melinda Gates Foundation who encourage young people to use their skills, passions and interests to develop creative answers that could lead to significant advances in terms of preventing, treating and curing diseases across the developing world. The competition was launched by Bill Gates in October 2016. Each year the competition will have a different theme and the most recent one was infectious diseases (see below). Many students from across the UK participated in developing projects that tackled a whole host of challenges around topics such as mosquito-borne diseases, transporting medicines in the developing world, and sanitation. Four of our year 11 students developed the idea of a bar of soap with counters and a dice inside to encourage young children to wash their hands properly. The soap was transparent so that the children can see what is to be released when they have washed their hands enough times to get to the middle of the bar. The packaging doubles up as the board for the game, and the soap’s ingredients included an anti-mosquito scent. Their project ended up winning the silver prize in the 2017 Youth Grand Challenges competition. This success has since led us to the Houses of Parliament, where we were invited to present to MPs before the launch of the 2018 Year of Engineering initiative. We have also been invited to the Liverpool School of Tropical Medicine to showcase the project and do some trials of the soap’s anti-mosquito properties. We have also proceeded to the finals of the Big Bang. All of these opportunities have increased the engagement our students have with professionals who they might not have had the opportunity to meet otherwise. For myself, the biggest benefit of getting involved was increasing the social mobility of our students. Young people are told that if they work hard and get a good education they will have the opportunity to do whatever they like. As we know, this is not always the case because they need to know what is available to them and they need those links to break into those field. The old saying of “it’s not what you know but who you know” is unfortunately still very true, but with the opportunities offered by Youth Grand Challenges those barriers can be broken by providing real-world opportunities for young people to engage with cutting-edge researchers, scientists and engineers. This, for our students, could potentially change the direction of their future career and widen their opportunities. Use social media, for example Google classrooms. At first you may think this will start eating into your own time but the team can get a lot more done between meet ups and they can be reminded of what needs to be done so no time is wasted when they do get together. Use anyone who wants to help, whether that be staff from your STEM subject departments or contacts in industry. Let your students come up with the ideas – it can be easy to want to guide them through this part but it is better to facilitate what they have in mind. Even if they look to you for answers, stick with it and once the ideas start to flow a project will come together. Don’t let cost put you off. CREST Award entry fees are subsidised by the government and won’t cost more than £20 for a UK project entry The BSA periodically runs grant streams to support schools with CREST entry fees and the support costs associated with running STEM projects. Encourage your students to take on registering the project, don’t automatically do it for them. The more ownership of the project they have, the better their project will be. Use other things that are already going on in your school to enhance your project. Our sixth form has an annual trip volunteering in Ghana in West Africa where they build libraries in schools. We used this opportunity to do the research and development part of the project and even had our sixth form students building hand-washing stations in the schools, as well as running demos and market research (comparing the soap they had made with the ones available in Ghana). Involve yourself in as much STEM-based CPD as possible. Take it upon yourself to find CPD that you think will benefit your students. I have been very lucky with the support I get from school and the quality of courses offered by the National STEM Learning Centre. Keep up-to-date with STEM agencies to stay informed about what is going on. The All About STEM website is a great place to start and will help you discover many STEM opportunities. How to research key information from the internet. How to experiment – i.e. the making of the soap and the consistency needed in order to make it transparent and hold the embedded toys in place. How to experiment with the smell of the product using different oils. How to make character counters with a 2D printer. How to design a logo on a computer. How to make packaging which included our logo design, board game and info about hand-washing and ingredients etc. How to experiment to show that the soap was both attractive and appealing to the target audience. How to contact other organisations and specialists for help and advice. How to work together as a team in order to make sure goals were met. How to brainstorm in order to create new ideas. Even if you don’t enter for the Youth Grand Challenges, I would still recommended the CREST Awards enrichment programme. The UK’s only nationally recognised scheme for STEM project work, the CREST Awards recently turned 30. In that time, more than 400,000 young people have been involved with the scheme. It now reaches 30,000 students each year. CREST is open to five to 19-year-olds, encouraging young people to do real-world, creative STEM projects and giving students hands-on experience of being a scientist or engineer. Hazel Duffy is a senior science technician at Rainford High and Sixth Form College in Merseyside. Gold: Blaise Cloran, 14, from Our Lady of Sion School in Worthing (pictured above), who designed a quicker and more cost-effective way of diagnosing hepatitis in developing countries with a test that can be easily transported without refrigeration and that doesn’t need a trained professional to administer. 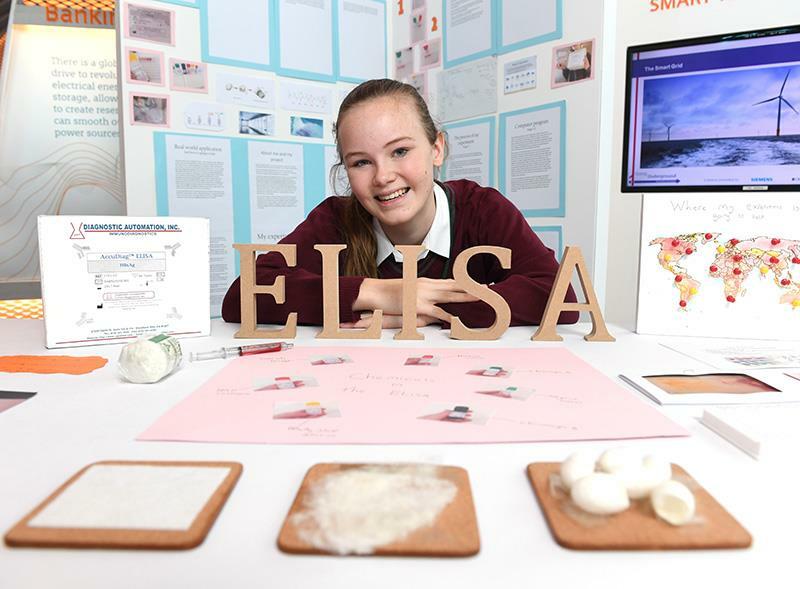 Silver: Students from Rainford High and Sixth Form College in Merseyside created an innovative way to get kids to wash their hands – by putting a game inside a bar of soap. Bronze: Two students from Worthing created a period kit to tackle the huge school drop-out rate from girls in India due to the poor period sanitation when they hit puberty. Discovery: Two students from Essex made a hand-washing device that uses rain water for communities without clean water.